Thank you for your very informative and insightful articles on the subject. Education is a very vital and important pillar of society. I'm also proud to see Paetenians like you achieving new heights and success in their chosen fields. Keep up the good work. Let me just share with you and your readers a few thought I have on the subject. I am neither an educator nor an academician and therefore my ideas are those of a layman and pure common sense. First, I'm glad that the Philippine government is addressing the issue. It's been long overdue that we do something about it seriously, before our society goes down to the sewer of history and oblivion. Without proper education, we will just be like roaming dinosaurs. Eventually we will become extinct. • The culture - schooling, in addition to preparation and learning a trade or profession is also a vital ingredient in molding the young into good, law-abiding citizens, with clear understanding what is right and wrong. It is not the sole responsibility of the government to provide good, quality education. We are all in it together; the schools (teachers, etc. ), parents/family, students, government, and private sector (community). We are all players and must assume our responsibility to make it work. • Curriculum - The school teachers and administrators are in best position to design a curriculum that will effectively deliver the desired results. More than just teaching students the 3 Rs, curriculum must also include courses that will train and nurture them emotionally, intellectually and hone them into makers of sound judgment and decisions, with good sense of responsibility and self-restraint. Psychologists and researchers have proven in many cases that by the age of 3-6, an individual have already formed and acquired his/her personal likes, dislikes, prejudices, perceptions and how they look at the world. It will make sense, therefore, that we start our kids early thru early childhood development schooling, even before kinder. Parents are big part of this, of course. Math and science are vital, but more than numbers and signs, the curriculum must include courses for critical thinking, how to think, logic, forming a hypothesis-experiment, then coming up with result and conclusion. And of course train them how to express and articulate their thought and conclusions. • Teachers - must be well-trained, well-paid (adequately and timely), and capable of imparting knowledge, intellectually and emotionally to students. They should have continuing education programs to catch up with trends and innovative methods of teaching. They must be able to challenge the students’ imagination, and creativity coming up with their own conclusions. Teachers must be able to relate to students and understand the child’s intellectual and emotional make up. • Methods - There are many ways and methods thru which students may acquire knowledge, learn a principle, or concept. Chalkboards and lectures are slowly becoming things of the past. With modern technology, education can be both informative and fun. Check some works done by people and places like the Kahn Academy, and of Daniel Goleman on the subject. There are many more sources of materials to draw from for innovative ideas. • Materials and facilities - it is imperative that there are adequate school rooms and learning/training materials/books, playgrounds, etc. This is where government plays a major role. A 2.6% of GDP for education may be adequate or too small. The school's number crunchers can figure it out. 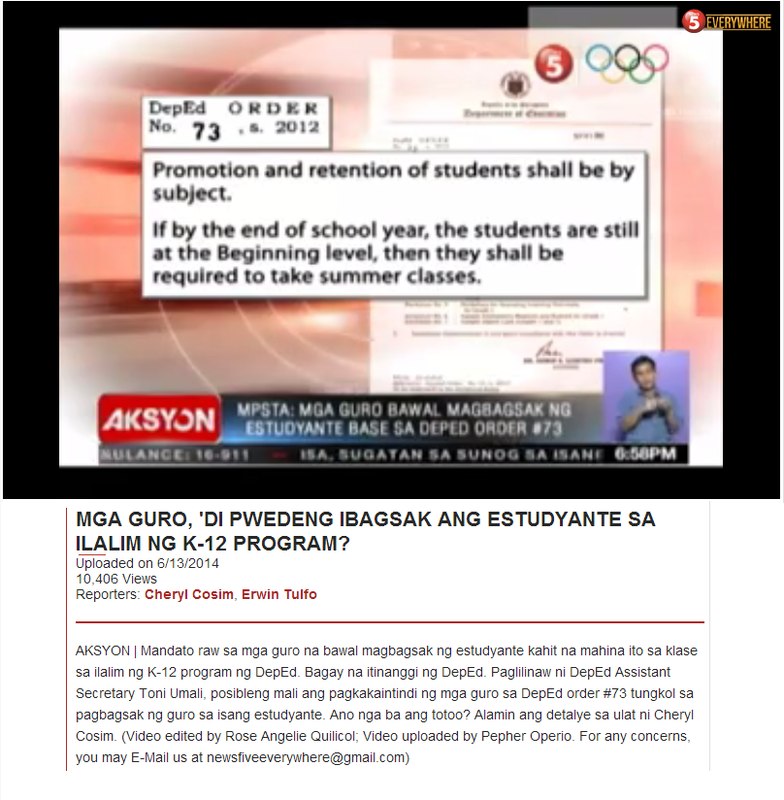 But the overwhelming premise must be that education is of utmost importance, therefore, "hindi ito dapat tipirin." Of course education is very much tied to economy. So funding for economic development, e.g. infrastructure projects, should not suffer either. • Administration - One source of funding is a well-oiled, simple and effective administration of our school system. Government must review its structure, staffing, procedures, etc. to eliminate work duplications, red-tape and bureaucracy. I won't be surprised to discover significant savings if the authorities do this honestly. And of course, graft and corruption, patronage and the likes should not even be an item of discussion. Policies set must be sustainable, sound, fair, with wide, general application, and must work regardless who are in power. • After-school programs, school-home interactive activities - schooling is not the sole responsibility of the schools. Parents have a big role in it. Schools, working with parents, can be more effective if parents understand the needs, capabilities, learning strengths and weaknesses of children. Renovate and innovate the PTA. • Private sector (community)- has a big role in education and they can be a major source of funding, and ideas on school improvement. The education system must build a bridge that will get the private sector and the community as a whole to take a greater part in educating our children. Scholarships and co-op/internship programs are good examples of how the private sector can be instrumental. • Testing, Research, Higher education - For us to know if the system is working, there must be a method of effective testing on how our students are learning. How effective teachers are in delivering values and results. Continuous evaluation of testing methods must be had. Higher education training should be encouraged to do more research to find out what work and what don't. Find out how children who went to early childhood development training end up in the workplace, or in society in general, as compared to those who did not. Find out what family characteristics help children to do well in school and reaches college, obtained a degree and do well in their profession. I would guess that these things are now being done. Perhaps it is time for evaluation to see if we are achieving set goals. These are raw ideas that just came up in my mind, Angel. I posted this with very cursory edit. More power to you and keep up your good work. I hope that people at the helm are listening to this conversation. 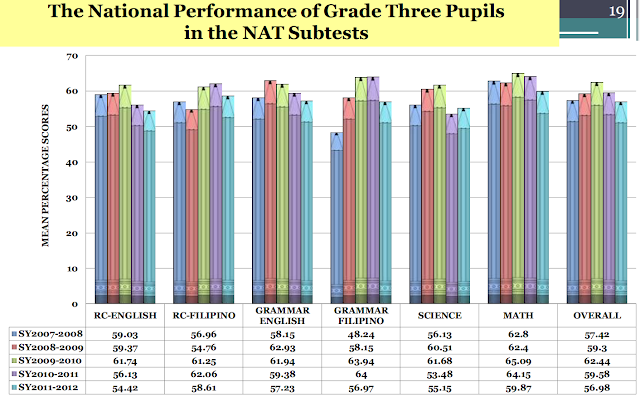 I firmly believe that the Filipino people can turn our education system around and make it work. It will not happen overnight. It will be a long process, but given enough commitment, honest hard work and funding, together, we can turn our dream into reality. I hope your network includes people who we can work with. My remaining energy, resources and ideas will be most useful if I can use them for the success of this project. The purpose of this blog is to send a message to teachers, parents and scientists. I believe a true reform of Philippine basic education will begin in the classrooms and inside our homes. The fruitful change, in my opinion, has to begin inside the classrooms and laboratories of the universities and colleges where teachers learn. And it has to be cultivated within the hearts of our homes. Thank you for your contribution to this discussion. you make running a blog look easy. The total look of your web site is magnificent, let alone the content! My website > Ist ein Strompreisvergleich sinnvoll? This post is really well knowledgeable. I read many blogs and articles regarding this topic. But I found that it’s good one of them. Awesome way of posting.